Valentine’s day is a weird and wonderful time in Japan – women give men chocolate, cats and dogs living together, it’s all topsy turvy. So to celebrate we’re going to dust off our classic Valentine’s Day material and hand out chocolates to ALL GENDERS because we looooove you. 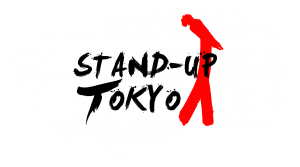 Tokyo’s flagship English Comedy Show, every Wednesday featuring some of the best of Tokyo’s comedy talent as well as up-and-coming stars. With help of the staff at Good Heavens, we are doing our best to bring a real sense of a comedy club to Tokyo; great stage, great sound, great drinks – and hopefully lots of laughs. And all in the surroundings of the uber-hip Shimokitazawa area. Just jump on either the Inokashira Line from Shibuya or the Odakyu Line from Shinjuku, either way, it’s just a 5-7 minute ride. Make sure you’re there at 8pm to guarantee yourself a seat. Tickets are STILL only 1500¥ including a premium drink so LET’S DO THIS THING! The event is no-smoking.